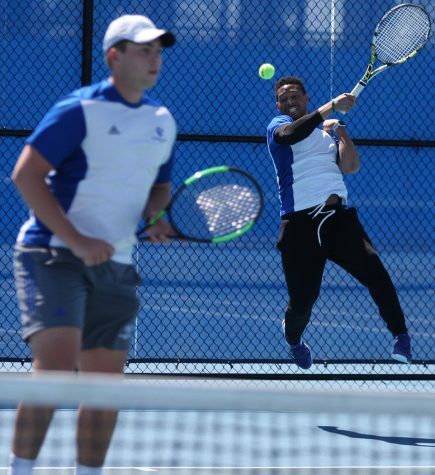 A season with no coach at its beginning has turned into one with a newly revamped roster and coaching staff that has the Eastern men’s tennis team riding high. The team that started with four wins in the 2016 season had a conference tournament berth last season and now has the most wins it has had since 2009 (10). 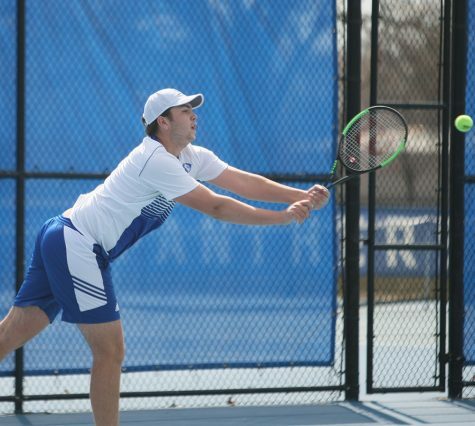 Eastern had its first home match at Darling Courts this spring and cruised past Rose-Hulman 6-1. The Panthers had a quick start, claiming all three doubles matches. Junior Freddie O’Brien and sophomore Daniel Hernandez paired at No. 2 doubles with sophomores Mike Jansen and Logan Charbonneau teaming up at No. 3 three doubles; both tandems won 6-2. Juniors Gage Kingsmith and Gertjan De Wilder also took home a win at No. 1 doubles, winning 6-3. 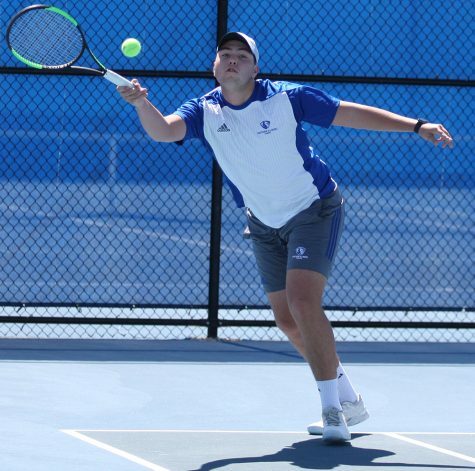 It was more of the same for Eastern, dominating the singles action by notching five of the six singles matches. O’Brien and Kingsmith both needed second set tiebreakers to claim their matches at No. 1 and No. 3 singles. 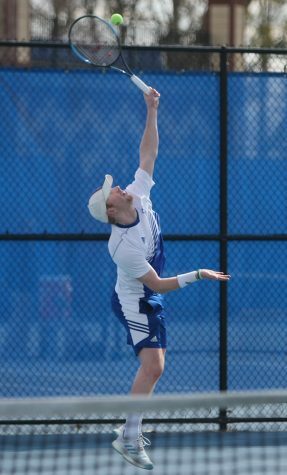 O’Brien won 6-3, 7-5 (7-5), while Kingsmith won 6-1, 7-6 (7-4). Another win is in the books for O’Brien standing at 11-5 at No.1 singles, and he took home the OVC Player of Week honors last week for his performances. 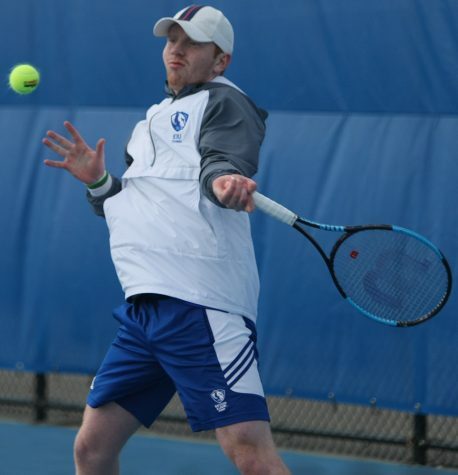 Despite not teaming up with Charbonneau in the Rose-Hulman match, O’Brien was 2-0 playing with Charbonneau at No. 3 doubles last week. The tandem sit 12-1 on the season in doubles action, including a perfect 10-0 at the No. 3 slot. For the team, it felt good to take home its first home match, and Charbonneau said it is a step in the right direction. Jansen can feed off how important this match was after improving his No. 2 singles record to 8-6. Just a couple weeks ago, the Panthers were stung with the injury bug with Jansen and junior Branden Davis sitting out. 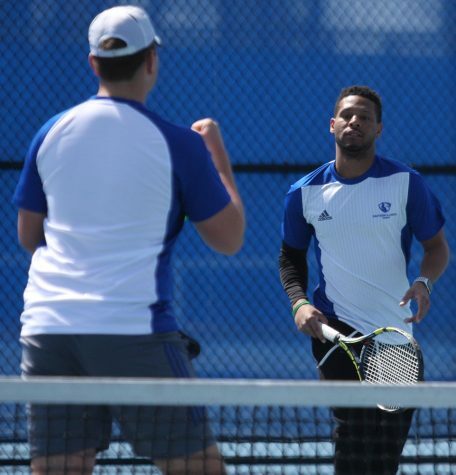 With Jansen back to full health and Davis nearing a return, Chris Tolson, interim director of tennis, sees this as a big opportunity. Vince Lovergine can be reached at 581-2812 or [email protected].